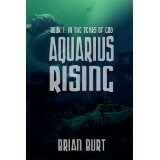 Brian Burt, self proclaimed computer geek, application security engineer and grand prize winner of the L. Ron Hubbard Writers of the Future contest in 1992, announced that "Aquarius Rising: In the Tears of God," has been nominated for the 2014 Electronic Publishing Industry Coalition eBook (EPIC) awards in the science fiction category. The story goes -- On an Earth ravaged by global warming, human-dolphin hybrids called Aquarians have built thriving reef colonies among the drowned cities of the coast. Now their world is under siege from an enemy whose invisible weapon leaves no survivors. Only Ocypode the Atavism -- half-human and half-Aquarian, marooned in the genetic limbo between species -- knows why. Ocypode and his comrades must face the perils of flight in the open ocean, a friend's betrayal, a killer storm, a lethal kelp forest haunted by mutant monsters and a fundamental challenge to their most cherished beliefs if they are to have any hope of saving Aquarius from destruction. In a recent interview Brian explained how "Aquarius" came about. "I've been writing for about twenty years now, but exclusively short fiction until recently, when I finally worked out the nerve to try my first novel. I originally started writing while on an extended IT consulting gig in Dublin, Ireland. Ireland could inspire anyone to get creative, I think: beautiful scenery, rich history, a sense of mystery and magic that emanates from the place and seeps into the visitor. It certainly inspired me!" "Aquarius Rising: In the Tears of God," is available form Double Dragon Publishing, a Canadian group formed in 2000 that generally publish science-fiction, fantasy, horror and paranormal romance but are not limited to these genres. Brian won the grand prize award back in 1992 for his short story "The Last Indian War" and was published in the "L. Ron Hubbard Presents Writers of the Future Volume VIII." He went on to publish short stories "Climbing Jacob's Ladder," "Soul or Elcipse," "Phantom Pain" and "The Brilliant Blood of Souls." As it is free-to-enter, L. Ron Hubbard's Writers of the Future, now in its 31st year, enjoys amazing success with thousands of entrants yearly. Created by best-selling author L. Ron Hubbard, the contest has to date launched the careers of 12 New York Times bestselling authors: Jo Beverley, Tobias Buckell, David Farland aka Dave Wolverton (with NYT bestsellers under both names, Nancy Farmer, Eric Flint, Karen Joy Fowler, Tim Myers, Patrick Rothfuss, Lisa Smedman, Dean Wesley Smith, Elizabeth Wein and Sean Williams. To learn more, including details on how to enter the contests, visit the website at http://www.writersofthefuture.com. To find out more about Brian Burt visit his Facebook page.